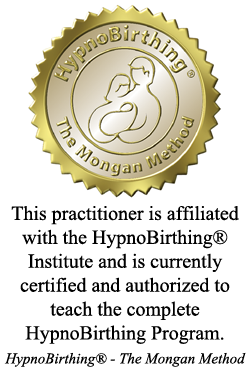 HypnoBirthing® – The Mongan Method is as much philosophy as it is a technique. The concept of HypnoBirthing® is not new, but rather a ‘rebirth’ of the philosophy of birthing as it existed thousands of years ago. The method teaches you that in the absence of fear and tension, or special medical circumstances, the birthing body is free to carry out the work it was perfectly designed to do, allowing the birthing mom to work with her body and baby, resulting in a more comfortable, satisfying, and empowering experience. You will gain an understanding of how the birthing muscles work in perfect harmony when your body is sufficiently relaxed and you trust birth. You will learn how to achieve this kind of relaxation free from fear, and as a result, you will be more in-tuned to and trusting of your baby and natural birthing instincts. While using the techniques you learned in HypnoBirthing you will be conversant and in good spirits – totally relaxed, but fully in control. Awake throughout, you will be aware of your body’s surges and your baby’s progress. In this calm state, your body’s natural relaxants, endorphins, replace the stress hormones that constrict uterine muscles, can cause pain, and slow labor. This natural flow of endorphins, along, with your ability to surrender, and support the natural energy of your birthing body, will enhance your ability to achieve the birth you desire. HypnoBirthing with Gold Coast Doulas was listed as most mentioned childbirth class in 2016 by grkids.com. 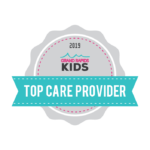 Ashley Forton of Gold Coast Doulas was awarded top child birth educator. 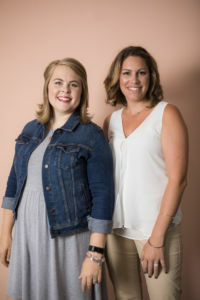 Check out our upcoming HypnoBirthing classes or register on our Contact Page (just click on HypnoBirthing and type in which class you’d like to register for). Check out the Fox17 Interview about the benefits of HypnoBirthing! Audio download card with HypnoBirthing’s own Rainbow Relaxation, and positive affirmations aimed at increasing your confidence for a healthy and successful pregnancy and birth. CD with additional relaxation and birth rehearsal visualization for bonding with your pre-born baby. – five professionally written scripts to use at home while practicing and preparing for your special day. – gentle breathing techniques used during labor to aid in relaxation and a healthy, happy baby. teaching and encouraging couples to be active participants in their health care experience. and type in “Please send me a registration form”. I just wanted to shoot you a note thanking you so very much for all your help before we went through our birthing process. I went into the hospital on Sunday and gave birth to our boy on Tuesday. There were some complications so the birth was pretty tough, but I did get to do it vaginally despite quite a bit of c section discussion amongst the doctors. Ryan was a great coach, and it has been a remarkable experience that really brought us even closer than before. Thank you so much for all you did, Ashley. Without the tools we picked up in your class, I’m not sure I would have made it through this crazy process! – the way it helped us think through the whole “concept” of birthing. – the way it allowed us to do this together. – the way I felt educated and prepared entering the hospital. – and last, but not least, the way it let us bring our little girl into the world drug free. I’d recommend it to anyone, even though the chicken part didn’t pan out. Hypnobirthing was a valuable tool both in pregnancy and labor. We really appreciated the information presented to us during class and were able to look forward to the birthing experience. We learned what to expect, but more importantly we learned to be flexible and accepting of what would come our way to make the birthing experience a rich one. Loved the class! It was a great way to learn not just about HypnoBirthing, but how your body works and what your body is supposed to do during labor. I learned how to keep my mind from getting in the way of my labor. Ashley is a great teacher and is super helpful with any additional questions you may have. I loved the actual meditiation in class. Her voice is perfect! I’ve thought a lot about how HypnoBirthing helped me in my pregnancy, labor, and delivery. The truth is that it made a huge difference in every stage. Before the class I thought I knew about pregnancy and birth, but it turns out there was so much more to learn. And we went into every stage with enough knowledge to talk openly and easily with our doctors. We knew what our birth preferences were and why we wanted things a certain way. We knew how to stand up to protect our baby, and we were given so many tools to stay calm, relaxed, loose, and limp. Without this class I know I would have requested pain medication and I know I would have been much more upset about a scheduled induction. But because I was able to make my own informed decisions, I have no regrets about our birth. I’d do it all over again! We took the HypnoBirthing classes which prepared us for all possible outcomes of pregnancy, labor, and delivery. This was extremely helpful, especially when I found out I would need to have a c-section. Not only did we learn the HyponoBirthing technique, I now feel so much more prepared for childbirth in general. The class covered the stages of labor, what to expect, breathing techniques to use, and so much more. Ashley explained, followed the flow of the book, and delivered the information in an understandable way. She was very easy to learn from! I am recommending this class to all of my friends – the information learned is truly invaluable! We learned a lot of very valuable info. I enjoyed all the science and physiology behind HypnoBirthing.